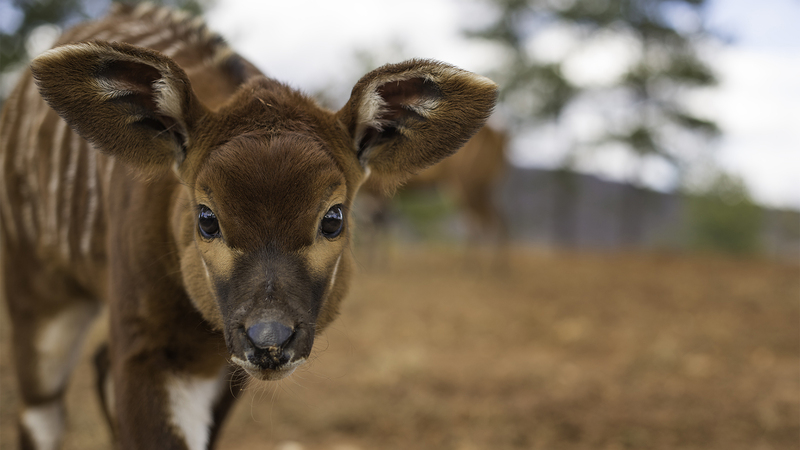 Our breeding group of Bongo has adapted beautifully to their new life here at the Wildlife Conservation Center. The habitat area for them has open fields for roaming and a forested area where they love to slumber during the day. We had our first baby born in September of 2016 and at least three more females are showing signs of being pregnant. 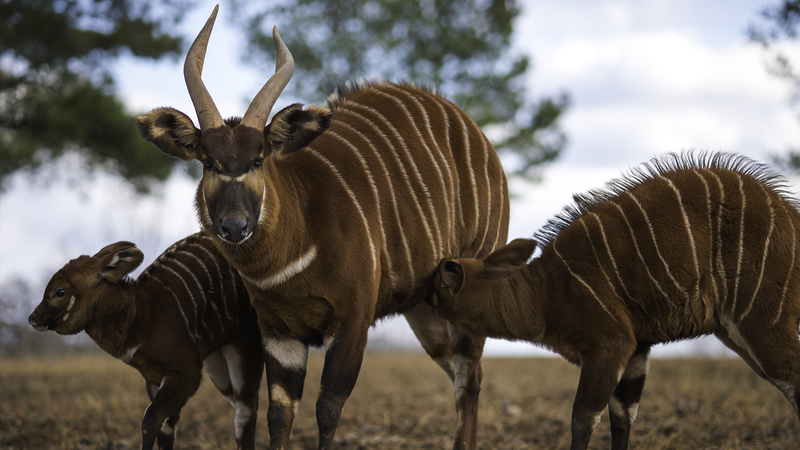 Our five-year plan is to provide a home for several separate breeding groups with a total population of at least 30 Bongo. A new Bongo barn is currently under construction and will be completed soon. The African Bongo Antelope is classified into two subspecies. These are the Tragelaphus eurycerus eurycerus, lowland or western bongo and the smaller and very rare T.e. isaaci, known as the mountain or eastern bongo of Kenya. Both look very similar having lustrous red-brownish coats with black and white markings and yellow-white stripes. Both sexes of these magnificent creatures sport long slightly spiraled and very thick horns. IUCN has listed the eastern bongo has critically endangered and the western bongo as near threatened. Unfortunately, the number of wild animals is rapidly shrinking for both subspecies due to deforestation and hunting. Man is the number one predator of bongo. The eastern bongo numbers have been reduced to a couple of hundred in the wild with more animals in captivity than in nature. Conservation is the critical key to helping prevent these dwindling populations of animals from becoming extinct forever. In 2004 there was a successful group project involving several conservation organizations who sent a large collection of bongo to Africa for rerelease into the wild. There are currently ongoing discussions to send another herd to Africa and us here at the WCC plan to donate several bongo towards this effort.